Camphill Corbenic and Camphill Scotland are delighted that Mark Ruskell MSP has lodged a Motion in the Scottish Parliament about his recent visit to Camphill Corbenic. The Motion highlights the excellent work undertaken at Corbenic to support people with learning disabilities and other support needs, and the significant contribution made by people from other EU countries to this work and concerns over the potential impact of Brexit. That the Parliament recognises the work of the Corbenic Camphill Community, near Dunkeld, which has provided residential and day care for adults with complex and severe social, emotional, intellectual and learning disabilities since 1978; understands that it has grown into a community of approximately 120 people, 40 of whom are adults in need of special care, who live and work with each other in healthy social relationships based on mutual care and respect; commends the establishment of the Poetry Path, which has been created by those who live in or attend the Corbenic Community, and combines the work of poets who live and work in Scotland with an accessible path through the quiet corners and magical places in the Corbenic estate; notes that the Camphill movement has attracted young people to Scotland for decades to live and work in these communities, but that volunteers and workers from EU27 nations are concerned about their immigration status post-Brexit; considers that many health and social care organisations rely heavily on workers from other parts of the EU and could not continue in their present form without that support, and calls on the UK Government to carry out an independent evaluation of the impact of Brexit on the health and social care sectors across the UK. The Corbenic Community very much enjoyed the visit from Mark last Friday. Mark showed a great deal of enthusiasm for and interest in the work we do here, taking time to see around the community, meeting staff members and volunteers from all over the world, and many of the residents who benefit from them being here. 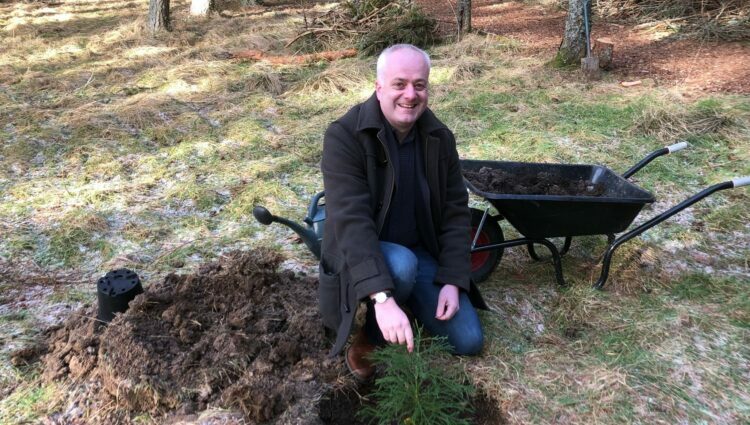 And Mark even had time to plant a tree along our poetry path before enjoying lunch in our café and shop in Dunkeld!